There are many different types of cellular kite with varying characteristics. They range from simple box kites to highly elaborate aerial structures, and even the simplest have an special appeal resulting from their 3-D nature which simpler kites lack. The Hargrave Box is the archetypal cellular kite, invented in 1893 by Lawrence Hargrave. The similarity of some of the earliest flying machines to a Hargrave Box is no coincidence. A large Hargrave kite can generate enormous lift. Pelham gives a plan for a Hargrave. Here is a picture of a Hargrave box flying with a rok. Born in Greenwich, England, Hargrave emigrated to New South Wales at the age of 16. His many experiments were aimed towards the goal of powered flight but he refused to patent any of his findings, preferring rather to allow anyone to build on them who could. Many people would recognise the traditional box kite, which is more common than the original Hargrave design. This is about the simplest form of cellular kite and in the past, has been very popular though it's less often seen today. It flies well in a moderate to fresh wind but only holds the flying line at a relatively low angle. This is because it requires quite a lot of sparing in relation to the surface area of its sail, which in any case, is held at 45 degrees and so generates less lift. Nevertheless, this angle acts as a dihedral which, together with the vent between the cells, gives good stability. Here are plans for a traditional box kite using a kitchen garbage bag and some dowelling. And here is a picture of a Gibson Girl kite - a box kite issued to allied airmen in World War II for raising an emergency aerial in case they were downed at sea. Improved lift can be had for a slight loss of stability by flattening it a little, resulting in the rhomboid kite. A traditional box can normally be transformed into a rhomboid simply by exchanging the equal length internal cross-spars which hold it open by two pairs of unequal length. It is instructive to demonstrate how the flying angle increases and the stability deteriorates as the kite becomes flatter. Plans for a rhomboid kite are given by Eden. Here's a rhomboid variant flying at Dieppe in 2006. 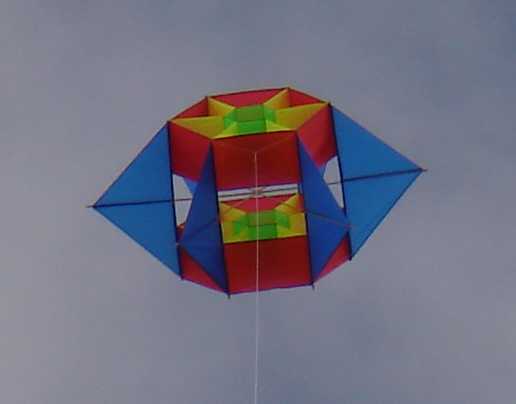 The traditional box kite can be improved by adding "wings" to provide additional lift so allowing it to rise higher on a given length of line, as in this picture. This is then known (not surprisingly) as the Winged Box Kite. Eden also gives plans for a winged box. 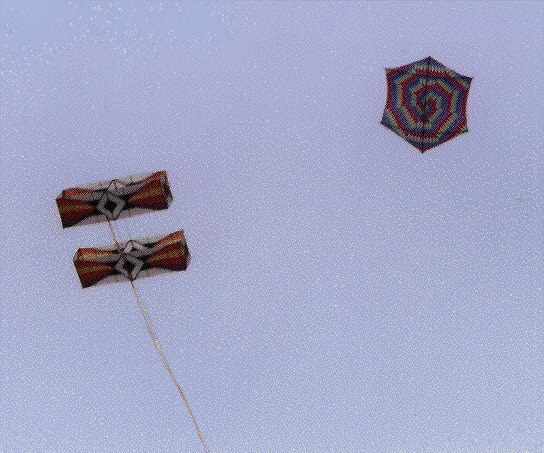 Alternatively, delta wings can be added to give a delta box kite, as in this picture of one built by Graham Dresch. Plans are also available. A particularly striking variant is the Pely Box, also known as the Tri-D, which is made entirely out of identical isosceles triangles. It gets its name from its inventor, New Zealander Peter Lynn. As compared with the traditional box, this design saves the weight of two of the four longerons at the cost of some sail area. This sketch shows a 3-cell version because, after several abortive attempts to draw it, I got carried away. But when I built a 3-cell pely, it turned out disappointingly unstable. The standard 2-cell version flies without a bridle and with the flying line attached directly to the bottom of the front cell, although Peter Lynn has been quoted as saying that a 3-leg bridle works better, with two legs attached to the ends of the front longeron, and the third to the bottom of the rear cell. Outline plans for a pely box are available, or you may like to consult Eden. Here is a picture of two pely boxes flying together, at Fanø 95. 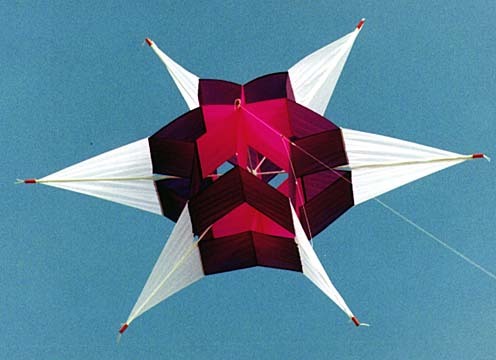 Triangular box kites can be made, but if you then add wings, the result is the Conyne kite. The pronunciation is disputed in kiting circles. (For what it's worth, I pronounce it as "co" to rhyme with "snow", "nyne" as in three threes.) But if you prefer, you can also refer to it as the French Military Kite since it was used by the French army for reconnaissance. It's also known as the Pilot Kite. Silas Conyne, an American, patented it in 1902. Not only do the box sections form a dihedral but they also result in the centre of lift being somewhat above the attachment points of the bridle. Together, these factors result in a very stable flying characteristic. Here's a nice picture of a pair by Dan Leigh. Moulton & Lloyd give plans for a slightly modified conyne. They claim that shortening the front cell a little gives even greater stability. Plans for a standard conyne are also available online. Here is a picture of one by Geert DD. George Lawrence used a train of Conyne kites to lift cameras for aerial photography. His most famous photograph, taken in this way, was a panoramic view of San Francisco after the devastating earthquake and fire of 1906. The negative was a massive 18 by 48 inches and it was published around the world, earning him $15,000. See it for yourself! 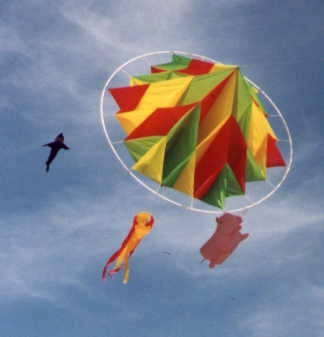 The Delta Conyne consists of a Conyne kite with the wings of a delta kite. This improves the aspect ratio allowing it to fly at a higher angle. Peter Batchelor's detailed plans include a photo of a large number of them flying as a train. For greater lift, a double delta conyne is often made, containing two triangular box sections side by side. Samuel Cody, an American born in Iowa in 1867, was a highly colourful and flamboyant character who enjoyed demonstrating his remarkable skills as a horseman, with the lassoo, and with the gun. When his interest turned to kites, after many experiments he settled on a winged variant of the Hargraves Box, which has taken his name. Here are plans drawn from an original built by Cody himself. Here's a picture of a modern one by Anthony Thyssen. When Cody arrived in England he invented much of his American background, with the result that many of the stories about him are fictional, not least his birth in Texas - a state he presumably thought would have more street-cred than Iowa - and his real name was not Samuel Cody, but Franklin Cowdery! With a train of his kites, Cody succeeded in lifting observers in a wicker basket, but when he approached the British military authorities they failed to take him seriously, on account of his flamboyance. Nevertheless, they were so impressed by his shooting skills that they offered him a post as a shooting instructor, which he declined. Only after crossing the English Channel in a 13ft boat drawn by one of his kites did they express interest. In subsequent experiments during 1904-5, Sapper Moreton was lifted to the incredible height of 2600ft! The military associations of this kite have lead to it often being referred to as the Cody War kite. There exists on the net a highly informative page of photos and plans of an original cody kite recently sold at Sotheby's. An enduring fascination with 3-dimensional structures led Peter Waldron of Worcestershire, England, to investigate ways of making kites with the greatest sail area and minimum weight possible. 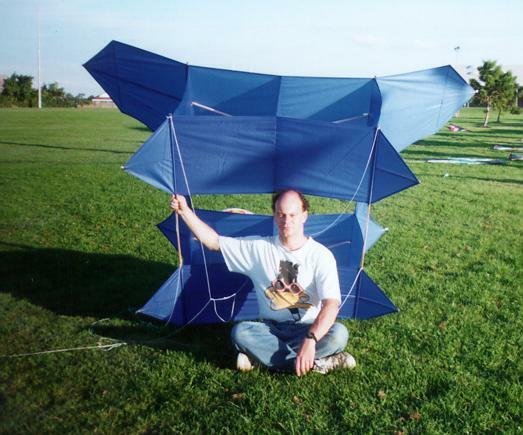 He called his first success in 1977, "Professor Waldof's Box Kite" - a 6-sided winged double box. Whether coined by himself or invented by another, he seems to have relished the unofficial title "Professor Waldof", as well as the common mis-spelling "waldorf", and association with the type of salad of the same name. The Waldof Box was only the first of a series of spectacular creations, including the Waldof Conic, and Superstar, as shown in the sketch. (Rest your mouse on it and look at the status line at the bottom of your browser to identify the variants.) The Conic has the advantage over the Box that if there are any small inaccuracies in the sizes of the panels, tension can redistribute itself throughout the structure instead of causing some panels to go slack. Here's a photo of one from kitestore.com. I think it's also more elegant, but the Superstar has been described as the most refined of the three. Here are the plans for the one I built, and a picture of it in flight. As well as linking several Waldof Boxes together into a huge assemblage like a space station, other creations were the Waldof Star - a 3-dimensional 8-pointed structure, and the Magic Box - a small winged box, easily assembled for flight by springing it open like an umbrella. Another spectacular multicellular kite is the snowflake, or facet. As with some of the more complicated cellular kites, it has an external frame rather than spars running through the middle. The frame is often hexagonal, (Morgan has a picture of one such) but there are advantages in making it circular, as in the sketch. Despite its appearance it's actually quite easy to make, as it simply consists of 15 squares of fabric, 3 large and 6 each of two smaller sizes, in the ratio 3:2:1. See if you can work it out. If each square is a single colour, you get a kaleidoscopic effect, but it's often made in a concentric colour scheme. Pass your mouse over it to see which you prefer. I built one 2m in diameter which always attracts attention, and I wrote up the plans in case you fancy building one too. Here's a picture of it flying with a couple of windsocks (purely for visual effect), and someone's shark in the background. Other multicellular kites exist, in fact an almost endless variety could be constructed by anyone with good 3-D visualisation. Some, like the snowflake, use external sparing, whilst others, like the waldof, have spars running through them diametrically. Those having significant front to back length are stable fliers but others are less so and tumble if given slack line. The philosophy "if you can't fix it, feature it" is appropriated by such "tumbling stars", which can wrap themselves up in their own line when given slack, and then unwind themselves again when pulled taught. Morgan gives plans for one. Here is a tumbling star by Anthony Thyssen. If the tumbling star fascinates you but you couldn't contemplate building one, consider the dancing cube. This is like just one box of a traditional box kite. Without the second cell and the gap between them, it's unstable, but because of that, great fun to fly! Carolyn Weir has compiled some simple plans using ripstop nylon. Alternatively, commercial versions are available quite cheaply, not only cubes, but triangular prisms and cylinders, known as the Triad and the Pop-can. Finally, to return to a simple structure, the circoflex consists of no more than a ring (like a wedding ring, or a very short section of pipe), with a flexible spar in the leading edge to maintain the shape. A line running through a pocket in the trailing edge is tightened to reduce the trailing edge diameter by 2% or so, and a multi-legged bridle is attached to the spar to hold it at an angle to the wind. The circoflex was invented by Helmut Schieffer and Ton Oostveen, both of the Netherlands, who introduced it at the Dieppe Festival in 1996 to great acclaim. 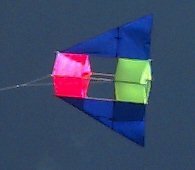 For several years it was probably the most discussed single line kite on rec.kites. Circoflexes are often built from mylar film (familiar as shiny foil gift-wrap) in sizes of several metres in diameter. Mylar tends to crease, but this only adds to the spectacular effect as the light glints on it. With a thin, barely visible bridle and flying line, this unidentified flying object always causes a stir among onlookers as it hangs almost motionless in the air, wobbling like a jelly in any slight gusts. If you don't have a sewing machine but want to build something that'll turn heads wherever you take it, this is definitely the kite for you, especially if you're handy with the sticky tape! The original plans are in French, but Anthony Thyssen has an English version for 7.5 and 10m circumference models He also has a collection of pointers to a considerable number of photos of circoflexes. Here is just one of them - a silver circoflex flying over a rocky outcrop in Leicestershire. Few kites look more like something from outer space! The circoflex is sometimes confused with the bol, but the two are actually quite different. In particular, the circoflex has a bridle with unequal length legs to hold it at an angle to the wind and so generate lift. It also has an almost constant diameter from the leading edge to the trailing edge.